Holiday Pack Plus is a DLC for Final Fantasy XV. It consists of a bunch of cool new accessories, carnival tickets and some attires. It’s available for all Season Pass holders. There’s also a free version called Holiday Pack, which is just a smaller version of it. 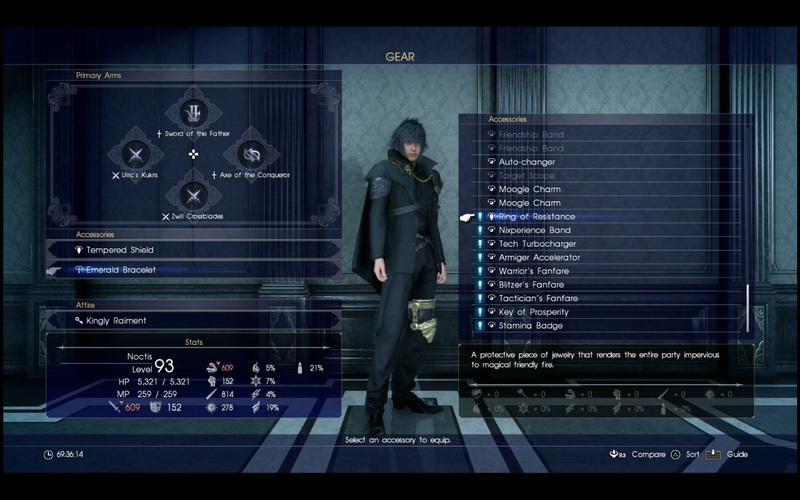 This guide is going to show you a list of all Final Fantasy 15 Holiday Pack Plus items, what they do. Warrior’s Fanfare – This is an accessory that grants you more AP for getting an A+ in Offense after combat. Nixperience Band – This ring stops your XP from tallying when you rest. This means you level up more slowly, but it also allows you to bank XP, then spend it all in one go after you take off the ring (especially useful once you can go to Altissia and use the 3.0x EXP hotel). You’ll also get a Carnival Passport, which allows you to take part in the festivities scheduled for the end of January. When the festival is live, you’ll receive a Choco-Mog Tee, a unique festive attire. Ring of Resistance – This item will protect your friends from your spells. Tech Turbocharger – Usable by Noctis only. Speeds up the tech bar refill rate, but stops the Armiger bar from filling. Armiger Accelerator – Noctis only. Gives faster filling rate for the Armiger bar, but freezes the tech bar. Blitzer’s Fanfare – An accessory that rewards quick combat with AP. Gain more AP for getting an A+ in Time. Tactician’s Fanfare – A scroll that rewards advanced combat tactics. You’ll get more AP for getting an A+ in Finesse. Key of Prosperity – Increases the drop rate for various valuable items, in turn giving you a better chance to make money. Stamina Badge – Anoter Noctis-only accessory, the badge prevents stamina loss when sprinting and hanging. The Carnival Passport is included here as well, though you won’t be able to use it until the end of January. You’ll get a mariachi-themed attire once the festival starts. The plus pack contains some exclusive photo frames as well. Keep in mind that you won’t get the regular pack alongside the premium one. You’ll have to download both if you want all the items.